Samsung Gear 2 is the latest iteration of Samsung’s smartwatch. It is also the top of the line of Sammy’s new Gear smart wearable line. Samsung Gear 2 looks a lot like the original Galaxy Gear, but now comes with swappable strap with the camera moved from the strap to the main body. 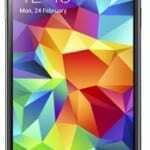 Samsung Gear also drops Android for Samsung’s Tizen OS with about twice the battery life. Samsung Gear 2 dropped Android, replacing it the Samsung’s much talked about Tizen OS. This is also why Samsung removed the Galaxy branding from the name. However, Samsung Gear 2 will still support about 17 Samsung Galaxy phones. Gear 2 is powered by a 1GHz dual-core processor with 512MB RAM and 4GB built-in storage. It shows you push notifications from your smart phone and you can answer calls on the Gear 2. It features a music player with speaker and support for Bluetooth headset. Samsung Gear 2 comes with a heart rate sensor on the back that monitors your heart rate. It features a pedometer and special modes for exercises. It also comes with Infrared that combines with WatchON remote app to enable you remotely control gadgets in your home like your TV. The Gear 2 smartwatch comes with swappable straps, giving you to choose from colourful straps to express your style and mood at any time. For now consumers can choose between Charcoal Black, Gold Brown or Wild Orange strap. Samsung Gear 2 features longer battery life with 2 to 3 days on full charge compared to just about 24 hours for the first Galaxy Gear. 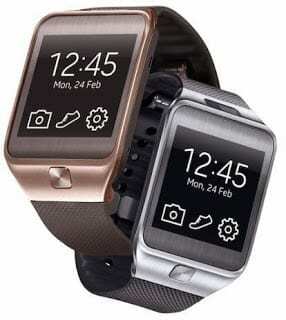 Samsung Gear 2 has a 1.64-inch Super AMOLED display with a resolution of 320 x 320 pixels resolution. It features a 2 megapixels camera on the body which can record HD video. Samsung Gear 2 will be available from April about the same time as the Galaxy S5. Samsung has not made the pricing official, but we hope the price is lower than that of the Galaxy Gear.